Here are two wonderfully evocative poems Hiram sent us. They may be carefully crafted, but they certainly aren’t fragile. and the trees from then are now two-by-fours. So why bother with such things that should be forgotten? Why let years ago get to me? I was as spilled in love as a glass of milk. Larew’s poems have popped up recently in The New Ulster, Voices Israel, Amsterdam Quarterly, Contemporary American Voices and vox poetica. His fourth collection, Undone, was published in 2018 by FootHills Publications. On Facebook at Hiram Larew, Poet and Poetry X Hunger. Spring has yet to come (in the northern hemisphere at least,) but winter’s breadth has done little to stop the slew of exciting ideas pouring from our elated hearts. Because the Hedge Apple is continuously spun with the preferences of student-interns, editors change with the seasons. That cycle of change results in an unebbing tide of fresh ideas each and every magazine. Mr. Garlock and Ms. Hogue have ascended into the hall of records to join hands with all editors preceding. The great unity that is locally known as “finishing the English program” is before them. Meet this Spring’s editors: Elijah Rokos, Ryan Jordan, and Jake Kemman. Now that we’ve introduced ourselves, we’re going to pick up where the last issue ended. To continue the glasnost begun by our esteemed predecessors, we are still accepting submissions from the wide, wide world and all the people in it–so keep ’em comin’, world. With that said, we can also formally introduce the first of this Spring’s themes, so keep reading. It’s a goodie. Society doesn’t want you to believe that your secrets matter. Hiding away your true selves and making it through the day with ingenuine smiles gets exhausting, but that was yesterday. Today, allow this digest to dive into your gutsy stories–sans reflux. Remove the protective layers of secrets and give in to the seduction of nakedness: loss, grief, love, need, poverty, addiction, obsession, social depravity, depression, mental health, oppression, sickness, heartache, detachment, dissociation, mind-numbing stress, and that which evades description. Regurgitate the ugly monsters from within, exfoliate the things that make you itch, strip your skin, and send those skeletons lurching into the light of day. We want the things that scare you, hold you, lift you up and drag you down. This February, air out your intestines between the pages of the Hedge Apple. Submissions can be anonymous or not–that part is up to you. Quit your itchin’, start bitchin’. 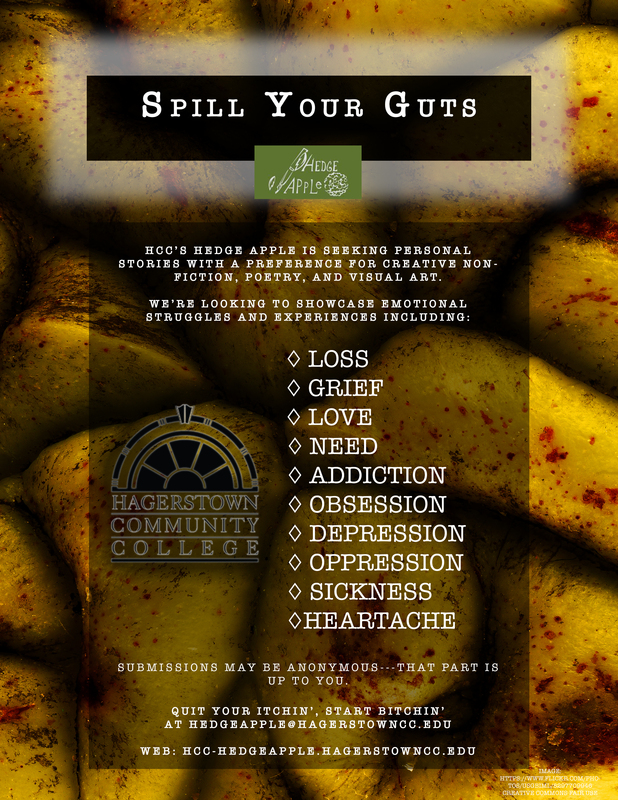 Submission period ends March 16. Before you go, set a reminder to keep checking back. We’ll update this page as the rest of our themes roll in. If you plan to submit for a theme, make sure to let us know in your cover letter. For more information, refer to our Submission Guidelines.